In the absence of a cure for osteoarthritis, current therapeutic modalities are primarily aimed at reducing pain and improving joint function by targeting symptom relief, without facilitating any improvement in the joint structure itself . The management of osteoarthritis should be individualised so that it conforms to the specific findings of the clinical examination (Figure 6.1) . This is especially the case for patients with obesity, malalignment and/or muscle weakness. Comprehensive management always includes a combination of treatment options that are directed towards the common goal of improving the patient’s pain and tolerance for functional activity. Treatment plans should never be defined rigidly based on the X-ray appearance of the joint, but instead remain flexible so that they can be altered in line with the functional and symptomatic responses obtained . Guidelines recommend that the hierarchy of management should consist of nonpharmacological modalities first, then drugs and then surgery [3–7]. Arthritis Foundation website. Disease Center. 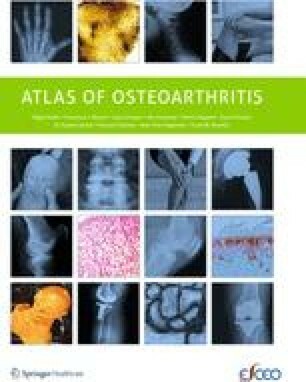 Available at: www.arthritis.org/disease-center.php Accessed 8 October 2012.